I am Ramya, an Internet professional who loves cooking. I am from India. I am basically from Coimbatore. I grew up looking the way amma prepares dishes in kitchen. Her dishes would be very simple yet tastier. She would add her own ideas into cooking and make the dishes more presentable that we(me and my sister) used to enjoy having it! Cooking is actually an art prepared with our love, creativity & of course the main ingredients. I just try some recipes out of my own likes & tastes when i sit idle at home. From amma i got that habit of adding creative thoughts to dishes. I got married & relocated to Chennai just few months back & from then started my journey of cooking. Till then i cook only during my free time or when i feel like trying some new dishes. Since i am working,I try new dishes during weekends. I wanted to organize or keep note of all the recipes i cook. We used to cook once & may forget it if we make a dish after a long time. SO i thought of posting it as a blog where many people could also be benefited. My in-laws are from Tirunelveli so my cooking constitutes both Pal-ghat & Tirunelveli recipes. I am a vegetarian so my blog will contain only egg less vegetarian dishes. After my marriage I learnt new varieties of dishes from my mother-in-law & my hubby's aunt. I will share with you all some of the dishes prepared & tried at home. 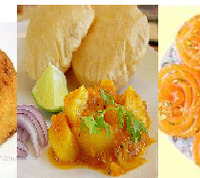 These dishes are either learnt from my mom, mil or aunt, tried from Googling various websites or through cookery books. I love taking pictures of the recipes i cook, but since i do not have sufficient time to take & post, i am posting recipes which i have googled across online. Excellent book for people who are new to cooking.. I love its vada sambar... Too yummy..